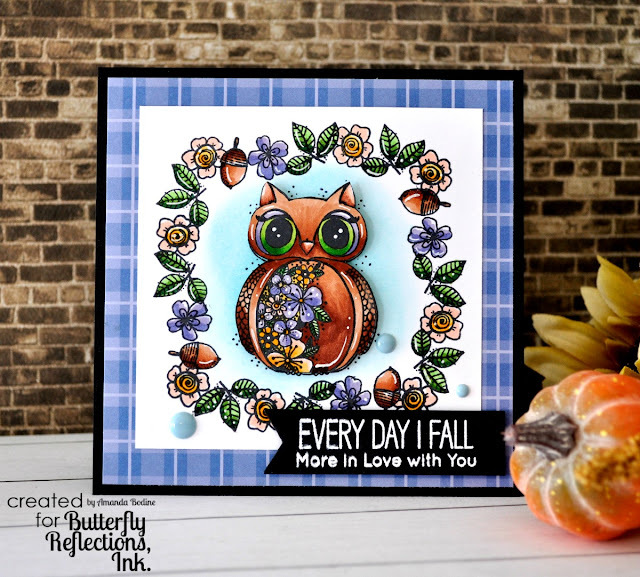 Hi everyone, Amanda here featuring a stamp set that's EXCLUSIVE to Butterfly Reflections, Ink, called Floral Fall. The images in this set were drawn by a FAVORITE artist of mine, Angie Blom. I just love all the little floral doodles drawn into the images! I started by cutting a 4x4 piece of white cardstock. I used GinaK Wreath Builder Stencil along with the small images, (leaves, flowers, acorns), to create my wreath. 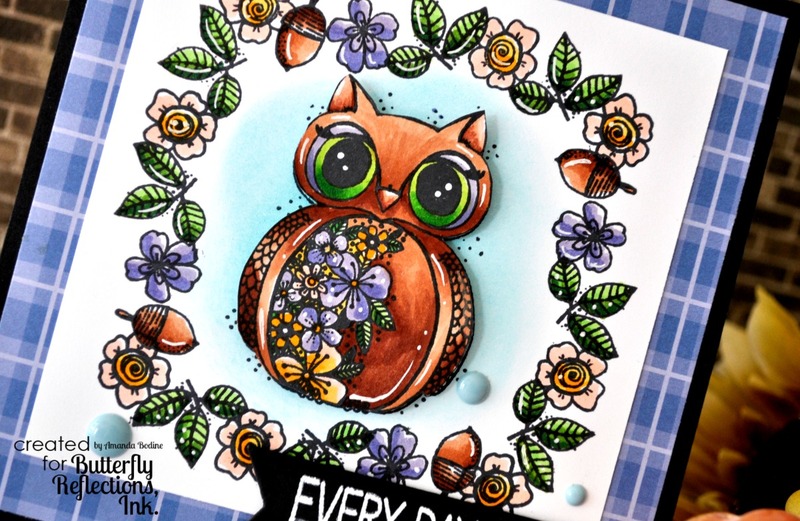 This is such a fun way to make your stamps go further, so if you've not tried this wreath building stencil, you are missing out on the fun! After I stamped out my wreath, I chose the owl, and stamped it once in the center, then again to fussy cut. I copic colored all my images, then I sponged on some Peacock Feathers Oxide Ink over the owl I stamped on my base. Then I took the fussy cut owl and popped him up over the oxide ink. My black card base is 5" squared and my patterned paper by MFT is 4.75" squared. I cut the banner using Newton's Nook Designs Frames & Flags die set. I white heat embossed the sentiment from MFT Fall Friends using Hero Arts Embossing Powder. Last I added some enamel dots from Echo Park. Thanks so much for joining me here today, make sure to pop in the shop to check out this amazingly beautiful exclusive BRI stamp set!